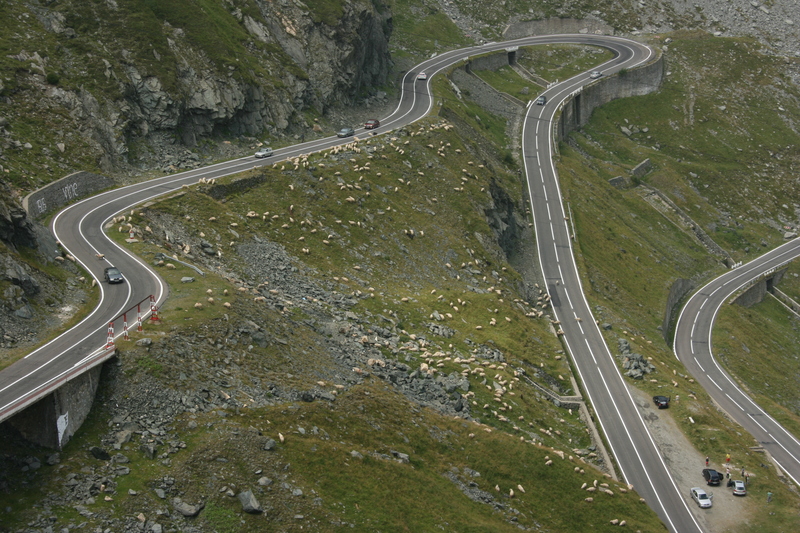 Transfagarasan, Romania | ride. travel. live. 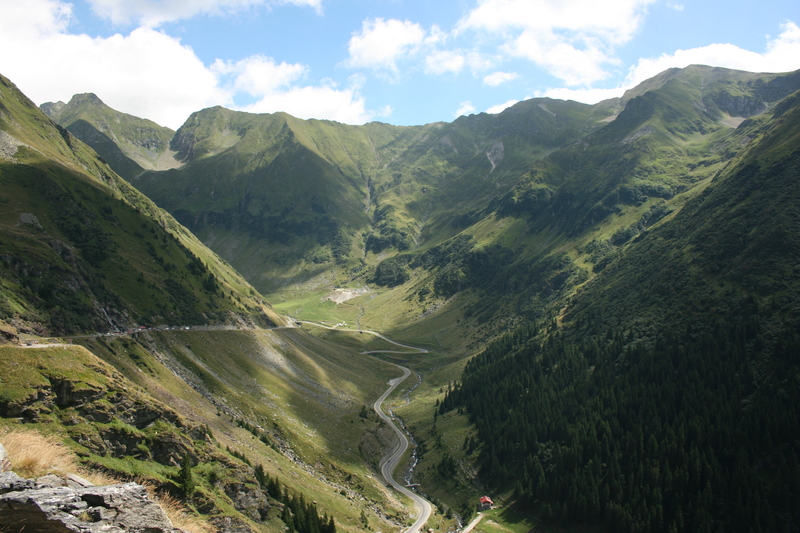 This was one of the grand projects of Ceausescu, the dictator of Romania, who ordered a trans-Carpathian road built over rugged terrain straddling two of the country’s highest peaks. So it was built between 1970 and 1974, at a staggering human cost. 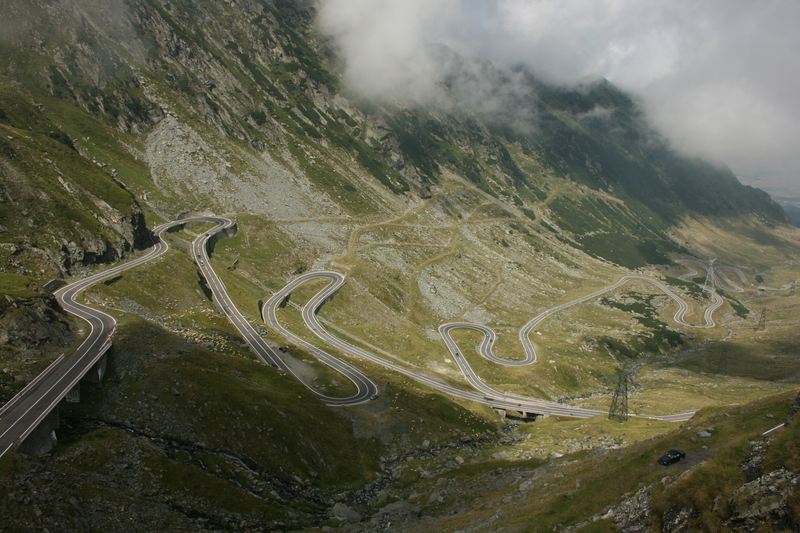 It’s one of the most spectacular roads in the world, and still relatively unknown outside of Romania. I decided to drive it on a recent visit to Transylvania. For the rather expensive cost of 50 Euro / day, a nice car was delivered to my hotel in Sibiu, and I ventured out into the sometimes intimidating Romanian traffic. After around 45 km of flatland driving, first getting away from the heavy traffic of the Sibiu area, then after a couple of old Saxon villages, a traffic circle marks the start of Highway 7C. The day was a mixed August day, warm in Sibiu, but changeable and much cooler up in the mountains. The climbing begins in earnest deep in the lower forests, with numerous curves leading up to the cable car base station. 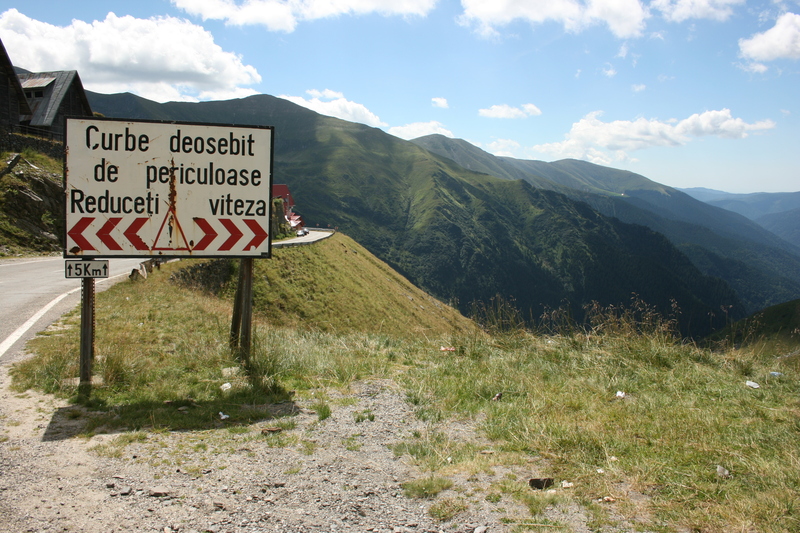 This is as far as the road is open in the winter, with the cable car making the remainder of the journey to the crest of the road, 800 meters higher. It was crowded with mostly local tourists and families enjoying the scenery and the large waterfall nearby. Past the station, the road backtracks for a short while in the direction of the plain, and then approaches a glacial valley, where the real fun driving begins. It’s never that steep a road, and it makes up for the relatively gentle grade with lots of hairpin curves and ever-more-panoramic views. Treeline is low here, I estimated it to be around 1500 m.
Finally, the road tops out at the lake, enters a narrow, unlit, potholed tunnel at just over 2000 m in elevation, and emerges into the much warmer, sunnier south slope. Beyond that the quality of the road deteriorates, and it’s very slow going on a bumpy, winding road that parallels the Vidraru reservoir. 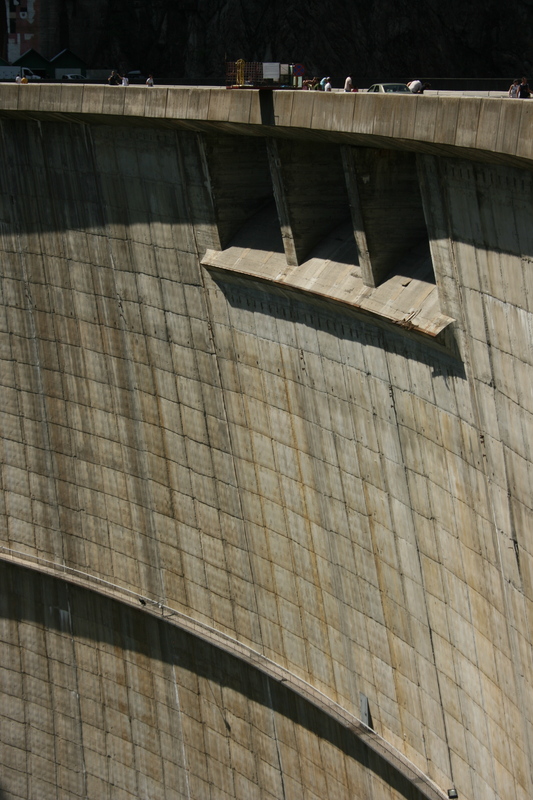 Suddenly, the road crosses the Vidraru Dam, a vertigo-inducing structure that is 166 m in height. More driving fun ahead. . . So this dam is a real trip to walk across. Its double-arch design incorporates a slight overhang at the crest, so it’s dizzying, to put it mildly. The location is difficult to access- on the western side two tunnels were blasted for road access. The north-branching tunnel leads to the most awful road imaginable, I tried to drive it for a few kilometers, and was shocked by the enormous potholes and rusting bridges. Needless to say, I turned around after a couple km, and rejoined the main road for the short drive down to Curtea de Arges. Camping is a big activity here, pretty much any open space on the side of the road is fair game for pitching a tent, and the air was smoky with barbecues and grills. Along with that is an unfortunate amount of trash on the side of the road. The same can be said for the areas on the north side of the mountains, it’s as if the construction had spent every last ounce of human effort, so there are plenty of reminders of the labor involved. As for road rules and driving in Romania, it’s manageable, but not for the faint of heart. For a nation of 22 million people, there are only around 270 km of freeway in the entire country. The main route between Sibiu and Bucharest is a two-lane highway through the Carpathians. Traffic is heavy, passing is careless, and speed limits are routinely ignored. Road quality is improving, but still require undivided attention. The roads off of the main highways are generally in terrible shape, and maps are often inaccurate. Horse carts and flocks of sheep are other fellow citizens to contend with. On the plus side, parking is gleefully easy, generally free, and driving is a fantastic way to get around the country. It’s a nice alternative to the much slower, albeit cheap, trains. 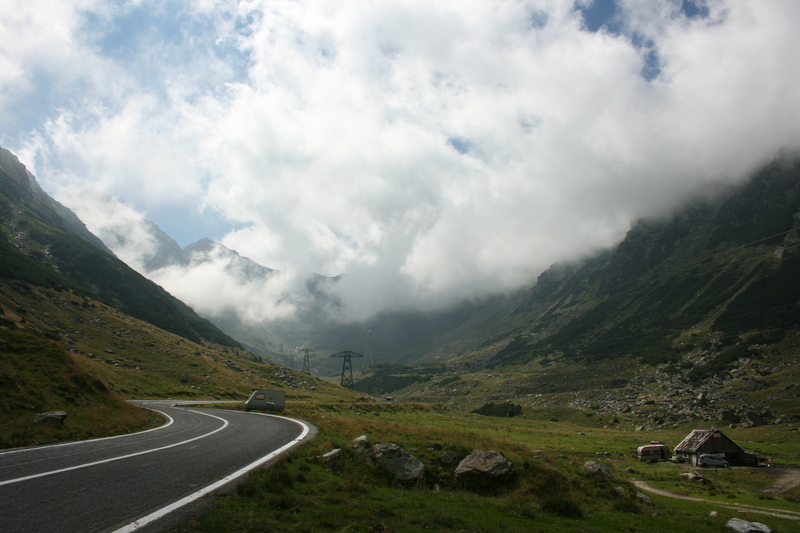 And for the Transfagarasan, driving and biking are the only practical ways of getting around the area. « Back shortly. . .